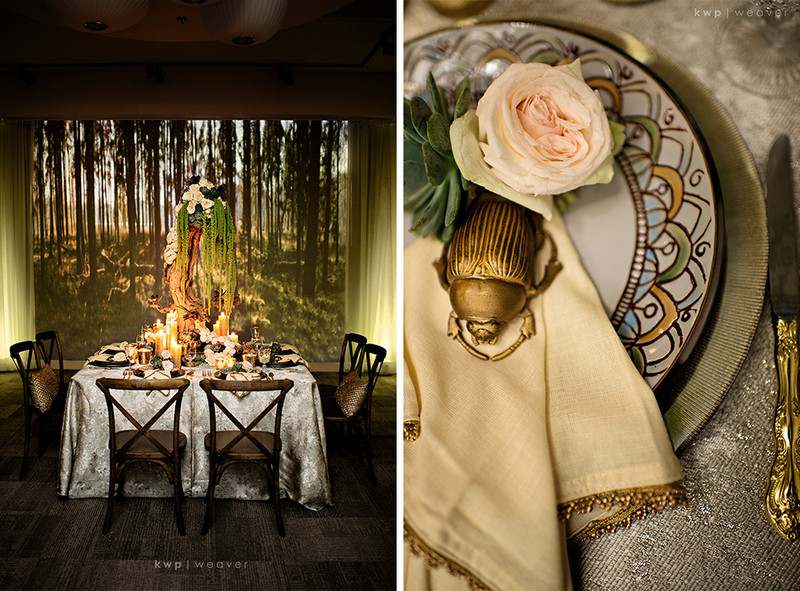 Stylized shoots are certainly the trend. Want to know all that goes into one? Our good friend and “friendor” has been doing high fashion ones for, well, ever! So many people do shoots and I always enjoy them. When the opportunity arrived to design ones ourselves… we jumped on it! Kristen Weaver handed me ideas that she had thought of when she first saw the Berta gowns from Solutions Bridal, thinking all things ballerina. She was besides herself and wanted to shoot all of them. in just over a week‘s time we were able to pull together three looks. For this shoot I was handed, “midsummer,” and went from there. When I think of Midsummer- I think of being in the most enchanted garden that so so overgrown that it looks like a Forrest. I think of magical things, but not fairies. If you know me and how I design, I want something that contrasts to make interest. You can see here the first thing that grabs your attention is that beetle bug! But since it’s painted gold, it was PERFECT for my enchanted over grown scenario. Wouldn’t you know it, where I got all of the gold bugs you will see, are from Target! Like most people, I think I live there. Loving those unique stoneware plates? Well, head on over to your local Target because, you guessed it, that’s where I picked them up! 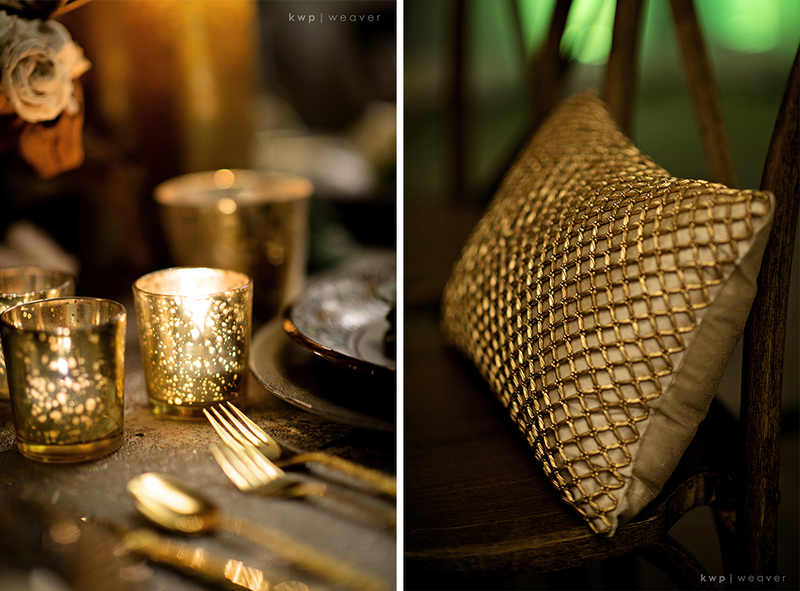 Want this romantic warm look at your home/Wedding/Event? Think about layering in different kinds textures and of materials. 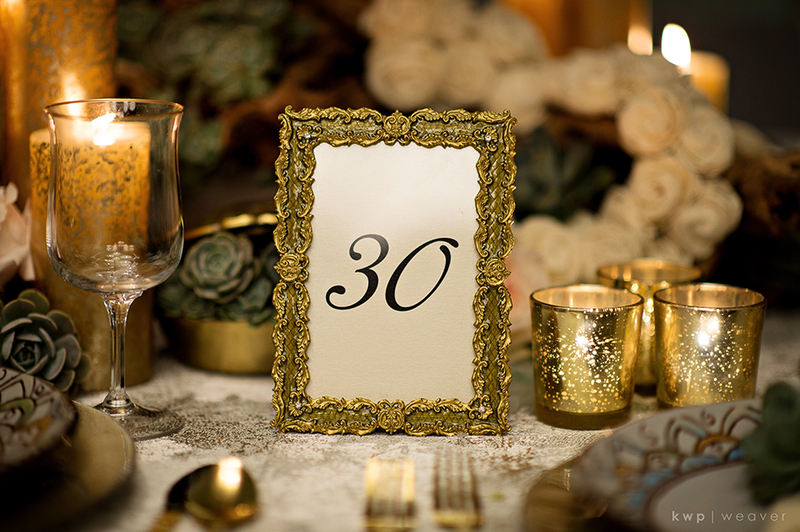 From the amazingly gorgeous wooden chairs from A Chair Affair to the individual table settings. 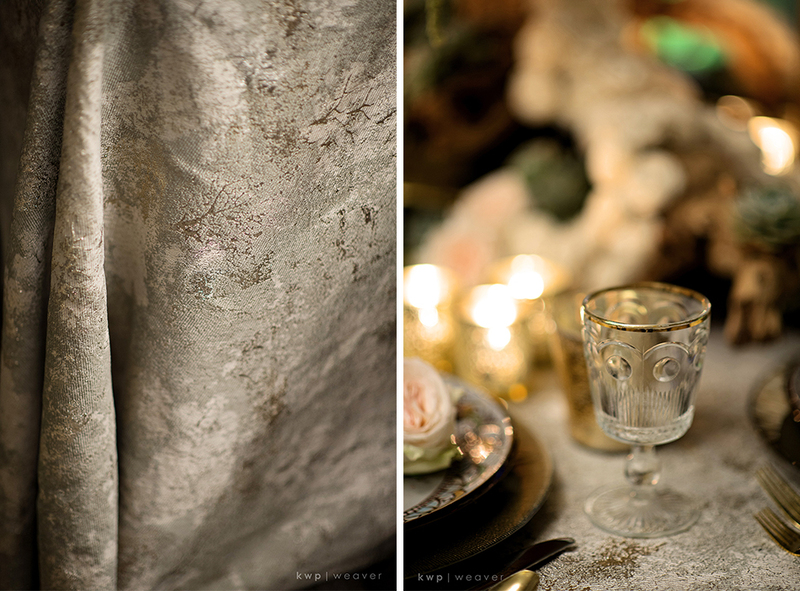 Starting at the base, this linen from Nuage is in itself layered in metallic and textures. 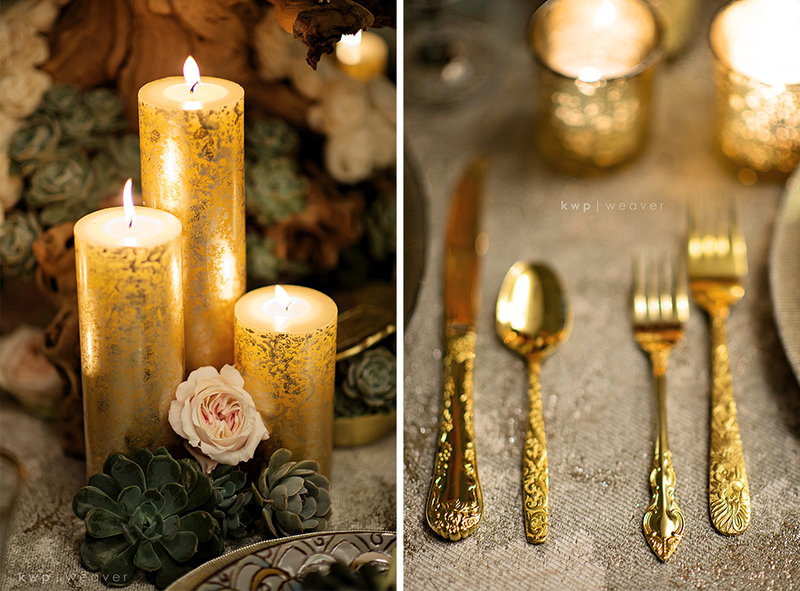 The hues are more in the silver tones but what better to have the golds and other metals pop? Think opposites (pick a color on the color wheel and do directly across) and complimentary (pick a shade and go to the left or right 2-3 shades and stay within that realm). In this instance we are talking about metallics so use them all. With subtle signs of lux we found these napkins at Pier One. 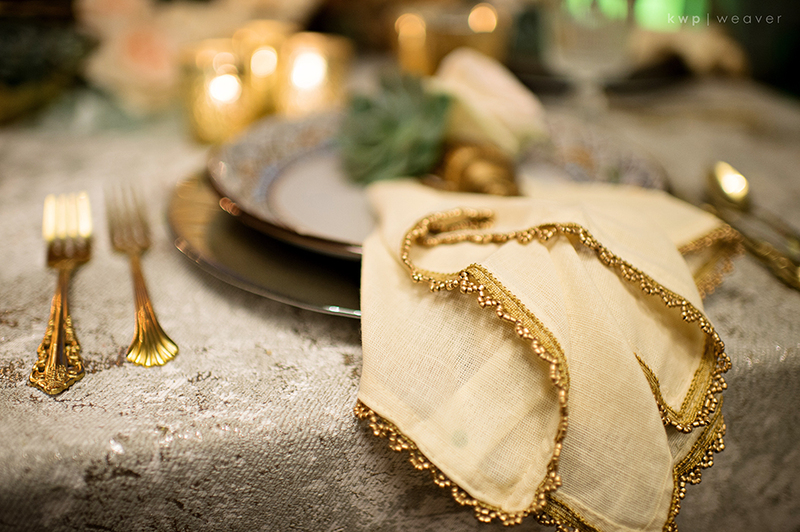 The Beaded edging was perfect to bring out the bugs and let the vintage gold flatware shine. If you adore something… grab it! Make it work, and in this case, it certainly did with our bugs. An enchanted forrest was all pulled together with the most unique of flowers and display. If you look into each and every nook and cranny, you will find something. 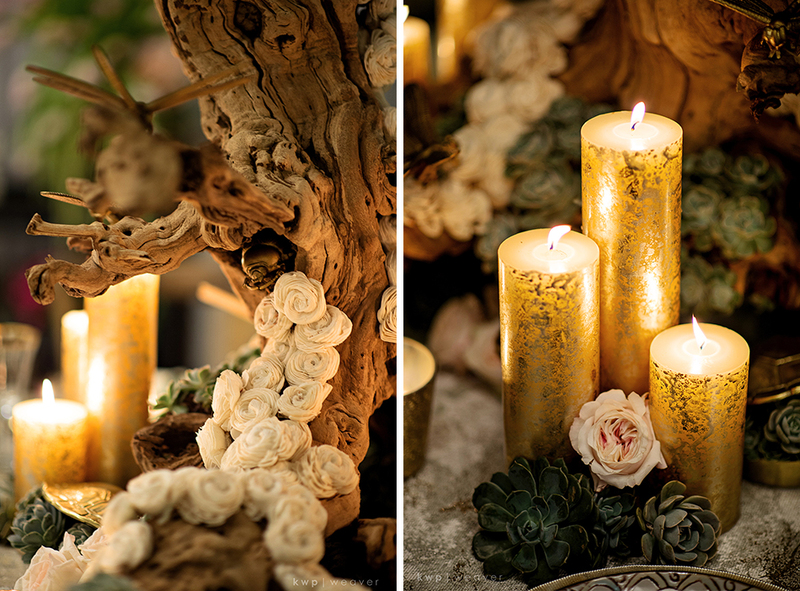 The lower lighting with the candles taking center stage bring out the wonderment of romance. From mercury candles holders to a range of pillar candles make this all come to flickering life. I do not believe that mixing metals is a crime as some do. 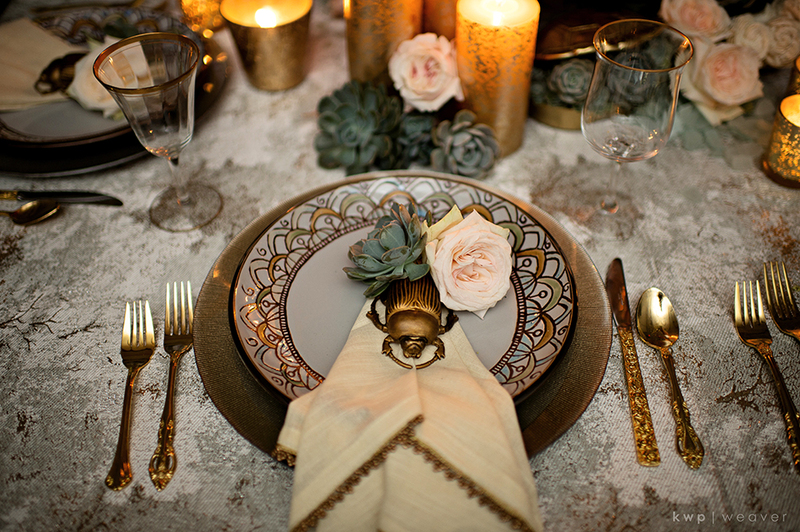 The gorgeous charger from A Chair Affair is a darker bronze, then surrounded by the glassware/vintage flatware and beaded edged napkins balance each other in perfect harmony. 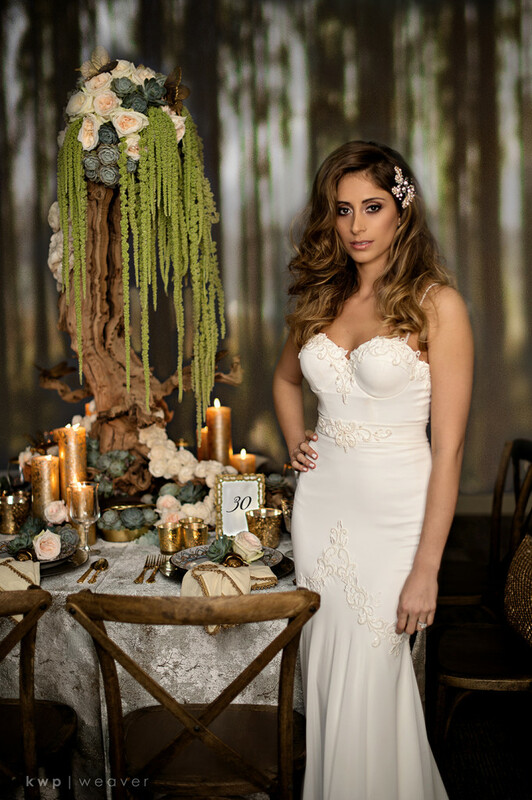 Solutions Bridal was hosting the trunck show for the Berta Bridal collection and this was our base inspiration for this shoot. I am in love with this dress. I love of effortless it seems. The smooth lines and light fabric mixed with the appliques and unique type of top was as if this dress was made for this shoot! This backdrop… this backdrop! Can we talk about this backdrop? Dj Jacob Towe came up with what was in my head. As if the sun is setting and the enchantment is really coming to life. This backdrop was the most asked about thing in our shoots! Is it wall paper? Was it added in photo shop? This is a live projection that Dj Jacob Towe offers to all of his clients! The trees actually move and sway with the gentle winds gracefully going in and through the trees. Would you ever guess that we were in a basement? The ever modern and beautiful Aloft Hotel in Downtown Orlando hosted our shoot in their modern ballroom. Blank walls make for canvases that are just desiring something unique to be shown on them. Another worthy pause in your photo scrolling… these florals and trunk! Miguel from Blooms Inc out did himself effortlessly (Who am I kidding? Him and his team started this the NIGHT BEFORE the shoot)! These curious looking white florals? Those are actually hand crafted from wood. 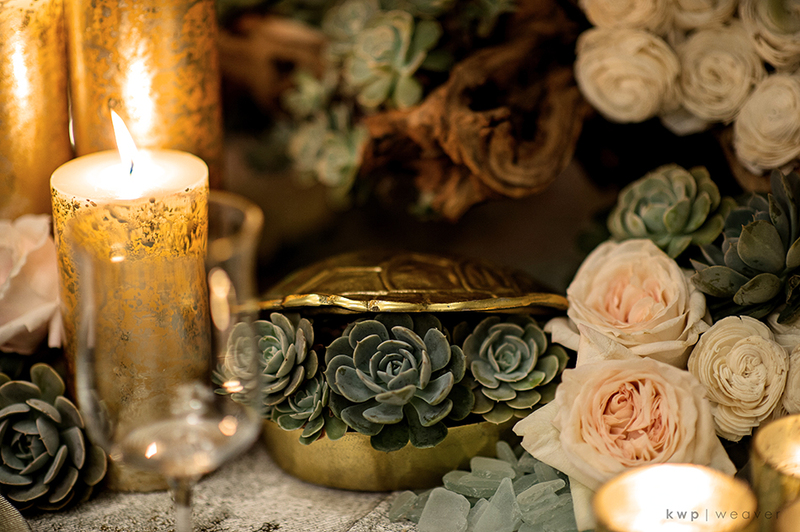 These unique wanna be floral mixed with the soft hues of the pink garden roses and rough/thick green succulents were certainly what dreams are made of. 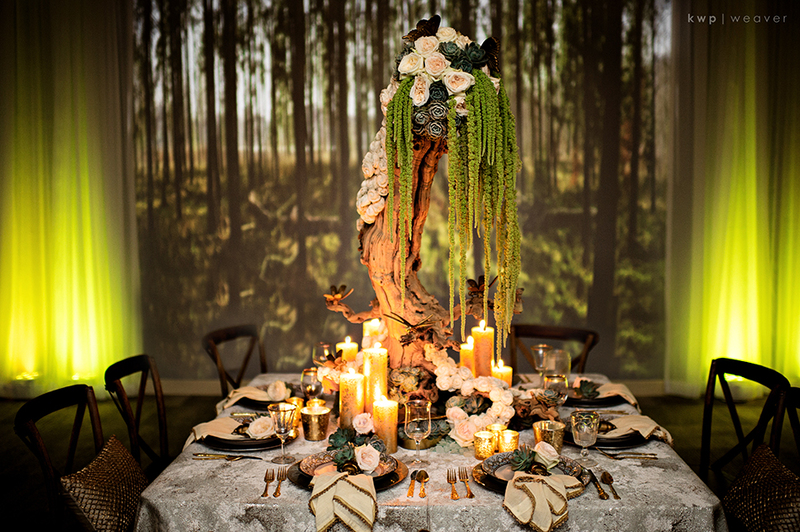 Drape them all onto a grape wood trunk… yes please! I like to imagine that he warm candle light is actually the moon glistening through. This pillow from Pier One captures the light and dances right on top of the chairs inviting anyone to take a seat. I get this from my Mother… but more is more and always seems to be oh so over the top glamorous! Hey girl, Hey! Meet our gorgeous model, Ananda, who is also a past client of Kristen Weaver Photography. Follow her gorgeousness on her fashion and style blog here. Pure Confection! 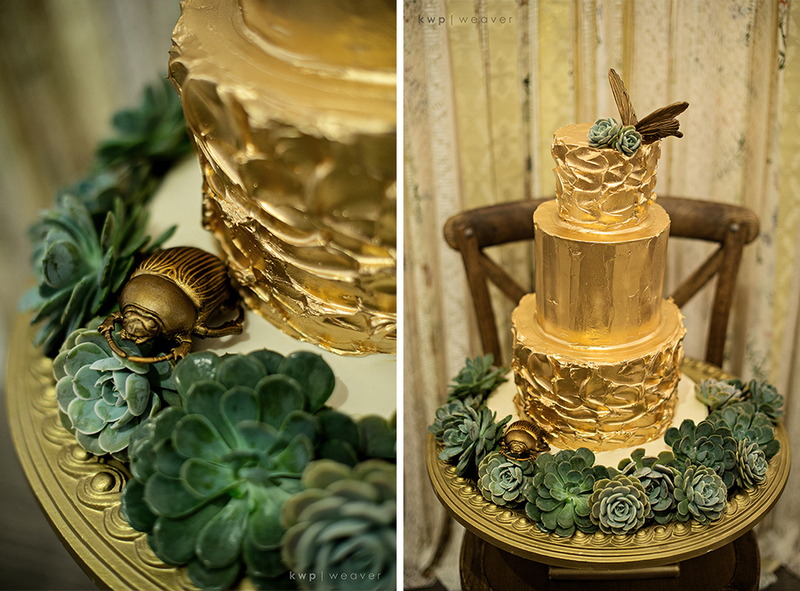 This cake is gilded in gold and what I love most about it is how the butter cream is actually imperfect with it’s bumps and ridges but then dip it all in gold…. PERFECT! Surrounded by our succulents from Blooms Inc this is exactly what I imagine is at the end of every rainbow. 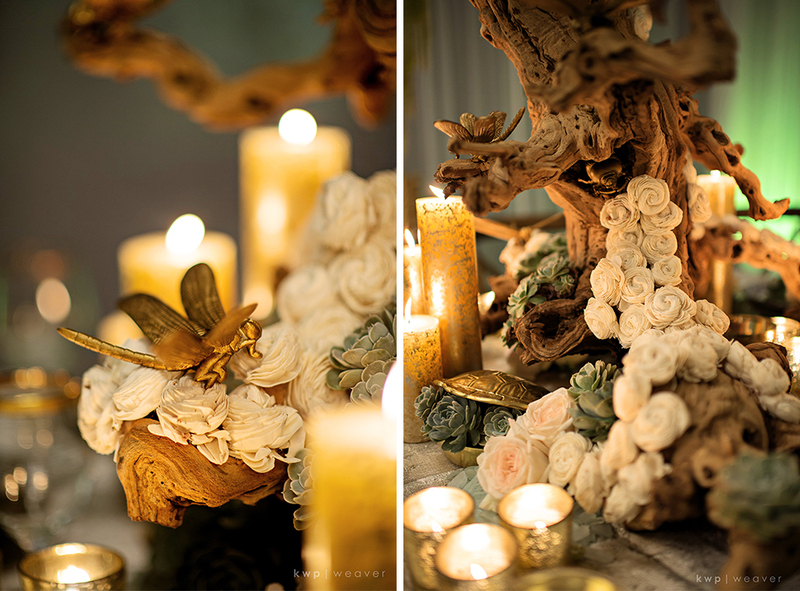 Simply placed on the french country chair with the hand made photobooth backdrop from Kristen Weaver and have it come to life with over sized mythical creatures and you have a very sweet ending. 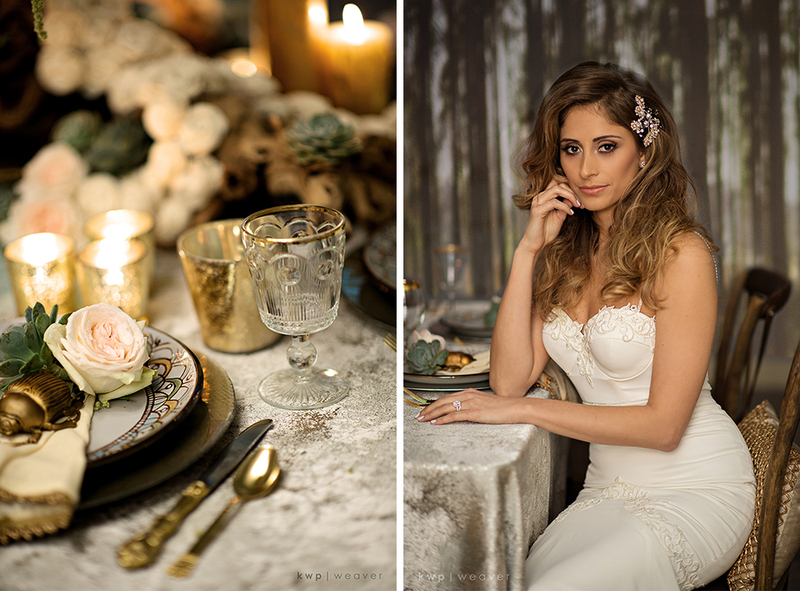 This shoot was planned in just over a week and took about 8 hours on the day of (not including the time the night before for our amazing floral) and we could not have done it all without the vendors we adore. Thank you for all of your time/ efforts and above all, love!